6) "Look who's here to see you." 29) "Now What Do I Do?" 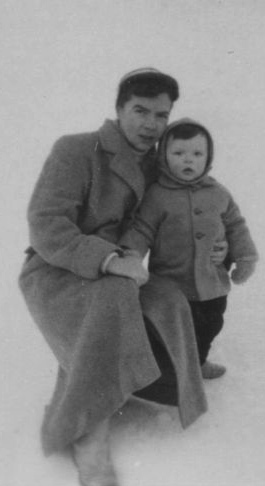 My mother, Mabel McLaren, suffering from dementia, had already been living in a care home for eighteen months when I began to write a regular blog about visiting her there. The over 50s' company, Saga, published 'Visiting Mabel' on their website from May 2010 until July 2014. The early blogs describe my time with my mother and father either at the care home, where the staff did their best to make Mabel's life comfortable, or out and about in our red Renault Modus, where Ian and I did what we could to make Mabel feel alive, tapping into what remained of her memories, her links to the here and now and her joie de vivre. 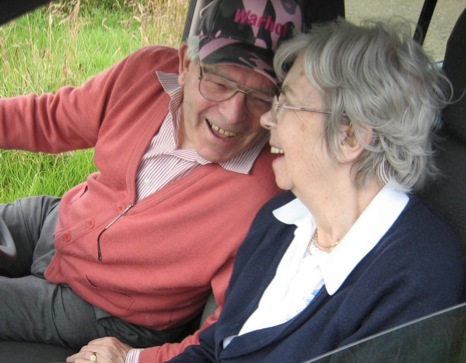 The photo below was taken the summer before the blogs were commissioned, and shows my mother and father enjoying each other's company in the front seats of the Renault, parked up in the Perthshire countryside. Ten of the blogs written in 2010 were shortlisted for the Orwell Prize in 2011. I don't see myself as a political writer, but this is political writing with a small - hopefully, poignant - p. I was going to list those ten posts separately, or give them a gold frame. But then I recalled that every single time I sat down to write a new blog, I tried to come up with something fresh and honest. The series went on for three more years and for 99 blogs in all. The 100th blog was written after Saga had terminated the commission. But what son ever stops revisiting the memory of his mother? In her prime, Mabel brought me - helpless - into the world; and when our roles were reversed, when she was on her way out, it felt like a privilege as well as a duty to be there for her. In autumn 2016, someone told me 'Visiting Mabel' had been highly recommended to them, but that it was no longer to be found on Saga's website. I wasn't pleased about this as I'd come to see the blogs as a 'permanent' memorial to the family life that my mother and father had given me. It took me a few months to get round to creating this new website, but here it is. Please pass the link to anyone you think might get something from it.